• Water resistant need no curing. 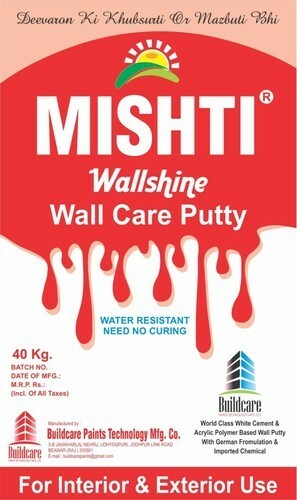 Incorporated in the year 2004, at Beawar (Rajasthan, India), we Buildcare Paints Technology Manufacturing Company are a Sole Proprietor Company that is counted amongst the distinguished manufacturing and wholesaling of the finest quality Wall Putty And Powder, Cement Paint, Decorative White Cement, etc. Under the incomparable mentorship of “Jaikishan Jaswani (Proprietor)”, we have reached the heights of success and attained notable position in the market.